One can enjoy this network of trails in either direction. The loop will take you around and down under the school. As you cross the bridge under the school, go left or right and the trail will loop again. The figure 8 loop is 2 miles total. Off the one loop there is a new trail about 1.5 miles long that connects to the inner loop in two places. About a mile of road can connect you from Kris Mar Woods to this section of trails. Then you can ride back Colgate to the top of the hill at red light, go left for about 100 feet then turn right into the field, see the singletrack marked with a diamond. Follow this trail and it will bring you out on blacktop just above the intersection with Green Street and Colgate Drive. Maps available soon to link all the trails in Marietta together. More trail on the way which will eliminate more road miles between singletrack. Can all be ridden by parking downtown. Visit the wonderfull little town while there. Visit www.rvmba.com for more details as they become available. 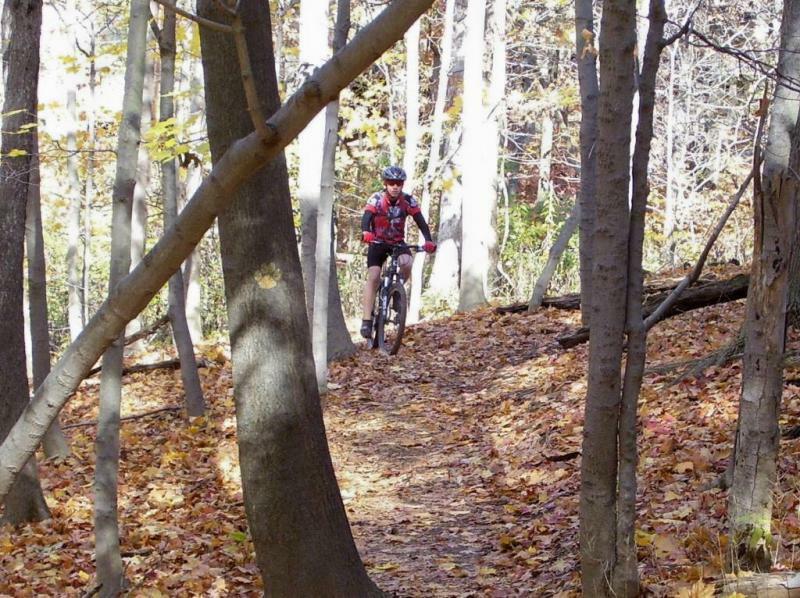 Review: A small part of a vast trail system in downtown Marietta. By way of city streets, this trail will connect you to over 20 miles of flow in the city limits. Review: A new trail has been added to the High School area. Cisler trail runs from Cisler Dr. near Jackson Park down to the High School trails. It adds a little bit of technical and speed to the trail system. 1.2 miles long. It's nice to have trails to ride right in town. Yes, they are not your technical riding you get in the Wayne, but it gets you in the woods. If you are so easily bored that these trails bother you, go play in traffic. If you connect all the trails in town you can get a good workout without driving miles to get other trails. I'm adding the gps to the map. Similar Trail: Kris-Mar Woods, Middle School Trails, North Hills Trail, etc. Similar Trail: Kris_Mar Woods, short but fun Kroger Wetlands, and soon to be enjoyed Middle School Trails, all in Marietta, Ohio. City Trails - Marietta Hs MTB Trail 3.50 out of 5 based on 7 ratings. 7 user reviews.